Mirkarimi at his office in San Francisco City Hall . Deed-o Bazdeed means to exchange visits with friends and family signifying the first 12 days of the Persian New Year celebration. On Friday March 21st, we will serve Chai (tea) and Shirini (Persian Sweet) while visiting each other in the customary tradition of Nowruz. The event also features the art work of three popular Iranian Artists representing Iranian themes and the Persian New Year: Nasser Ovissi, born in Tehran , 1934, Ovissi is one of the most popular painters inside and outside Iran ; Zaman Zamani is one of the most popular mixed media artists inside and outside Iran ; and Mohammad Hourian, born in Hamedan , Iran , the capital of ancient Persia , 1955, Mr. Hourian was the youngest artist to be elected to the Iranian National Academy of Fine Arts, at age 20. The works of these artists will be on display for one month. ISF PRESENTS: NOWRUZ 1387 FEATURING THE BLACK CATS!! Come join the University of Maryland's Iranian Students' Foundation for our Nowruz 1387 celebration!! Enjoy a program filled with dances, skits, poetry, DJs Saam and Eyece, dinner from Caspian House of Kabob and of course a concert by the BLACK CATS!!! Kids under 8 are free all night!! Buy tickets early to ensure availability!! We at the Persian Student Association would like to invite you to the Persian New Year's (Nourooz) Banquet. The program starts with Dr. David Rahni's speech who is a regional commentator on Iranian cultural and historical affairs. The event will consist of Iranian music and dances, alongside with Persian food provided by one of the finest caterers in the New York-New Jersey region, Shiraz Restaurant. We will also have a special performance by Ostad Amir Vahab, a renowned traditional musician, and DJ Babak. The event will take place on Friday, March 21st 2008 at 7:00 pm (Doors open at 6:00 pm) in the Great Hall. The space is limited, we encourage everyone to reserve their seats in advance. Contact us at persian@ccny.cuny.edu. 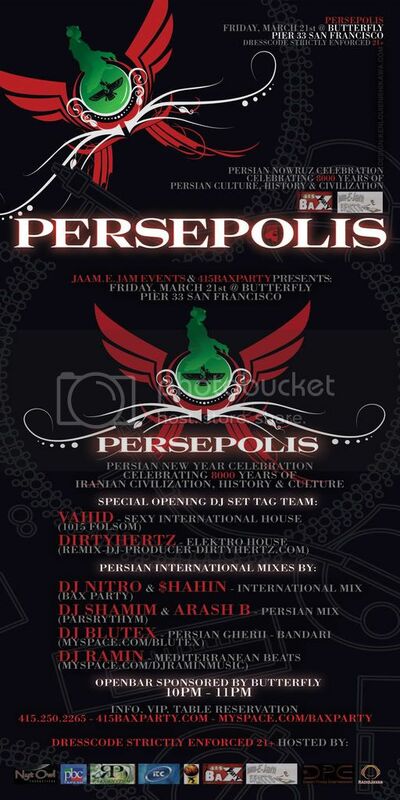 Bay Area'S #1 PERSIAN PROMOTERS present NOROOZ 2008! Persia SF(formerly Aria Productions), Mirza Party, SOL Y LUNA, and Nik from Apollo SF come Together at Roe NightClub with DJ AMIR, BARDIA, NIK, ARA5H, DIMITRIS MYKONOS & MORE IN A 3 STORY NIGHTCLUB! Roe Night Club, 651 Howard St.
in a 3 Story Nightclub! Persia SF(formerly Aria Productions), Mirza Party, SOL Y LUNA, and Nik from Apollo SF present Norooz 2008, a Persian New Years celebration event. Once again, we return to our favorite nightclub but for something really special. 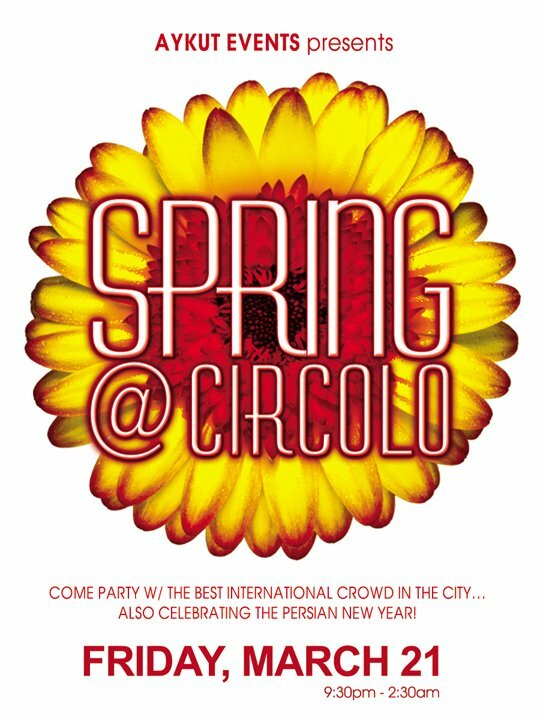 In celebration of Persian New Years, SF's top 4 Persian promoters have pulled together for one common cause, ONE AMAZING PARTY! 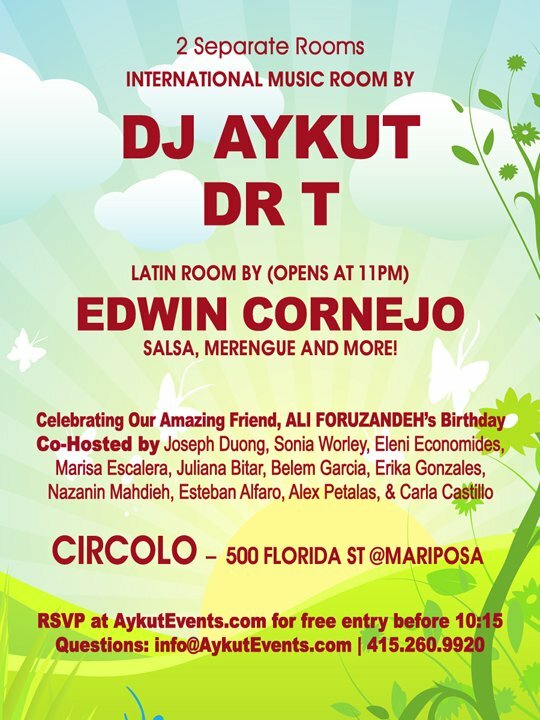 We've gathered many of the top Persian DJs in the United States to really make this a momentous evening. Come experience New Years in style with all your friends at San Francisco's most beautiful venue, Roe Night Club. With this combination of promoters, DJs, and venue...there's no doubt this will be San Francisco's #1 Persian New Years Party. Table Reservations are available for bottle service on all three floors. For more information and reservations, please email us your name and phone number and we will contact you shortly. Roe is an extremely elegant restuarant and nightclub. Dress code is strictly enforced, so please come to impress. ISF PRESENTS: NOWRUZ 1387 FEATURING THE BLACK CATS in Bethesda, Maryland!! Come join the University of Maryland's Iranian Students' Foundation for our Nowruz 1387 celebration at the Hyatt Regency Hotel in Bethesda, Maryland on March 21st! !